Most of us have ‘fallen asleep’ in a cab home after one-too-many wines. Though for one man that turned out to be a very expensive nap after he woke the following morning to find his Uber driver had turned a simple 16-minute journey from Imperial Hall to Millfields Road into a 20-mile tour of North East London. London bartender Daniel Kaizen revealed to BBC Newsbeat that he’d done his last shift in a cocktail bar and hailed an Uber while he was three sheets to the wind. ‘When I say I was drunk’ he said, ‘I mean blindingly drunk.’ Thank you for clarifying that one, Daniel. 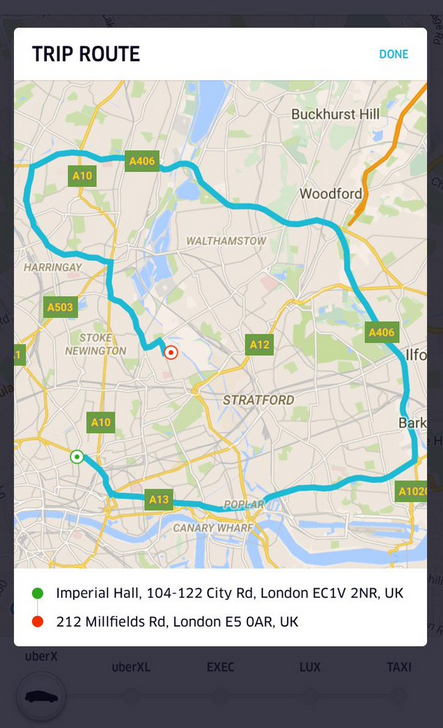 When Kaizen woke the next day to find his quick route home had cost him a whopping £102 (presumably making his whopping headache even worse) he went onto his phone to check the exact route the driver had taken. It’s still not clear why the driver decided to take this route. Possibly to maximise the fare. Possibly to explore the bright lights of Harringay and Woodford. Possibly because he’d forgotten he even had a passenger in his car. Well at least he got his money back, some of which he presumably spent on paracetamol.